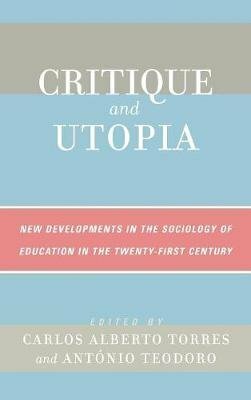 Critique and utopia are two of the central concepts of the sociology of education, and they indeed exemplify the critical traditions in the sociology of education as a discipline. This book analyzes, using theoretical frameworks and empirical data, the state of the art of the sociology of education at the beginning of the century, offering a systematic criticism of the dominant theories, and findings in the sociology of education. Key chapters focus on theoreticians who have made an impact in the discipline, including Basil Bernstein, Pierre Bourdieu, Paulo Freire. Yet, there is much more than theoretical analysis in this book. It also offers insights for policy and practice in diverse areas of education, including the formal, nonformal, and informal modalities of educational praxis.